In military training and simulation, the accuracy of the simulated image is paramount and replication of reality is the desired attribute. This is driven by parameters such as the microdisplay resolution, video image quality and colour gamut. So the choice of microdisplay will be the deciding factor on the efficacy of the simulated solution. Since 2002, the SXGA resolution microdisplay from ForthDD has been the leading microdisplay in military Near-To-Eye (NTE) training applications and has been designed into countless synthetic military training systems. Some of these have been in operation for more than 200,000 hours providing evidence of the lifetime of our microdisplays without image burn-in. With the start of QXGA resolution microdisplay shipments in 2013, training and simulation based on ForthDD displays will move another step closer to the ultimate goal of achieving the same accuracy and effectiveness in synthetic environments as in the real world. Whilst there is unlikely to be a complete move away from live training events in favour of the synthetic, increasing use and efficacy of simulation will have direct impact in reducing overall training costs and improving combat readiness. 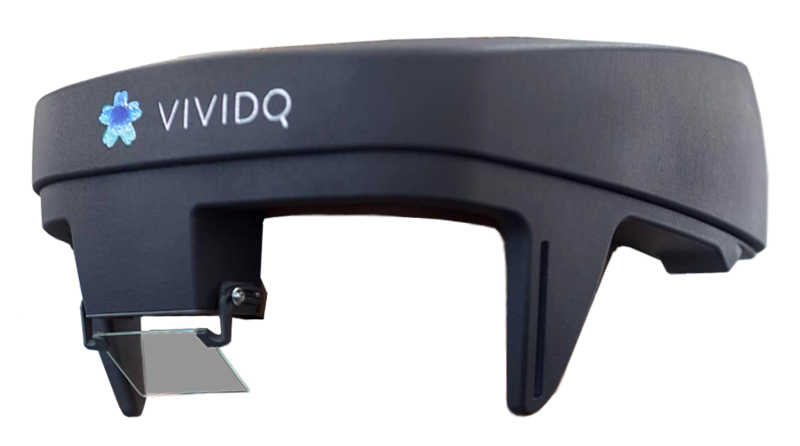 More recently, Vivid-Q created the first true 3D AR HMD by combing their real-time algorithms for computer-generated holography with the QXGA-R10 product. NTE which simulate the training environment are mainly based on head or helmet mounted displays (HMD). Head Mounted Displays are often used to simulate scenarios which may be too dangerous or expensive to replicate in the real world. By using HMDs to immerse the user in the virtual 3D environment, different scenarios can be explored in a safe but realistic manner. Due to their resolution, wide colour gamut, high fill factor, fast switching speeds and scalable brightness, ForthDD have become an important supplier of microdisplays into high-end immersive virtual reality (VR) HMDs. The compact size of our microdisplays makes them suitable for integration into VR HMDs, where space and size are key constraints. Further, the image quality delivered by our QXGA resolution microdisplays (at 2048 x 1536 pixels per eye) allows generation of the most realistic virtual environments achievable today. Simulated Military Equipment can be defined as devices that replicate weapons sights or periscopes whilst behaving like its real counterpart in that it will have the same form, fit, functions and controls of the actual equipment. ForthDD Microdisplays, with their size advantage, high fill factor, color and monochrome image quality, are easily capable of emulating the sighting systems associated with commander or gunner within a number of platforms. Successful and current microdisplay deployment can be found within a number of armored vehicle simulators, simulated periscopes for the training of submariners and weapon sights for missile systems. Mini-CRT viewers can be replaced by FLCoS-based mini-projectors offering a variety of image dimensions. Commercially available CRT replacement units with a variety of image dimensions are available from NVIS based in Reston, Virginia, USA. Typical Board Level Products SXGA-R3, SXGA-R5, SXGA-R6, QXGA-R10. Microdisplays are the enabling technology for head mounted and Near-to-Eye displays. In creating a colour image, FLC based LCOS technology is intrinsically and uniquely capable of a far more accurate rendering than any of the competitive technologies. LCD and OLED based technologies all suffer from fundamental limitations to image quality.